author/editor unknown. Contemporary British illustration: Sue Coe, George Hardie, Bush Hollyhead, Anne Howeson, Robert Mason, Tony McSweeney, Russell Mills, Gary Powell, Liz Pyle, Linda Scott, Peter Till, Ian Wright. London: Institute of Contemporary Arts, 1985. Baker, Steve. The Postmodern Animal, London: Reaktion Books, 2000. "In The Postmodern Animal, Steve Baker explores how animal imagery has been used in recent and contemporary art and performance, and in postmodern philosophy and literature, to shape ideas about identity and creativity. Baker cogently analyzes the work of such British and American artists as Olly and Suzi, Mark Dion, Damien Hirst and Sue Coe..."
Sue Coe, The Man with No Heart, New & Used Blab!, San Francisco: Chronicle Books, 2003. Coates-Smith, Wendy and Martin Salisbury, editors. Line No. 1: Reportage. APU Department of Art and Design, Cambridge UK, 2000. Cited in this discussion of the significance and the future of drawing as reportage is American illustrator, Robert Weaver: "'To fiction illustration the illustrator should bring the accuracy of journalism, to journalism the drama of fiction, and to editorial illustration the contradictions of reality.'" Includes well illustrated interviews with, among others, Marshall Arisman, Sue Coe and Ronald Searle. Coe, Sue, Faithful Elephants, from the forthcoming book, Zooicide, AK Press, 2018. 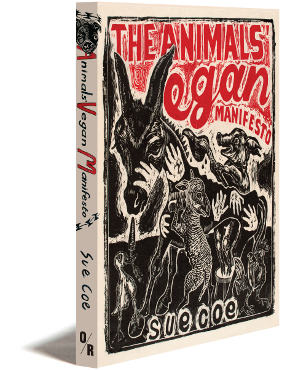 Coe, Sue, Zooicide , AK Press, 2018.
with essay by Stephen Eisenman. 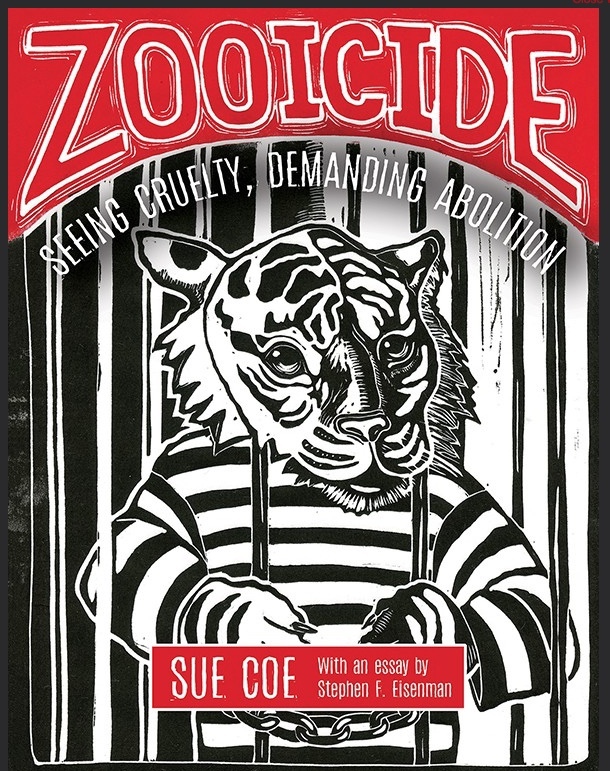 "In Zooicide, Sue Coe employs her bold artistic style to confront the institution of zoos. 'They are', she says, 'inherently cruel and the solution is not to reform them, but to abolish them.'" Feller, Deborah review of "Cruel"
front and back cover, -- image copyright © Sue Coe, 2005.
front and back cover -- image copyright © Sue Coe, 2004. 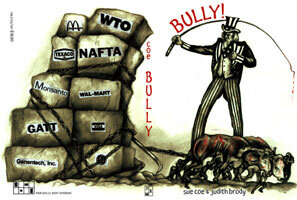 "Welcome to your global fun fair, here at Bully's Big Top!. . . Think of this little book as your guide to the wonders, the fun and profit of the best darned oligopoly since the Romans made 'Empire' a household word." 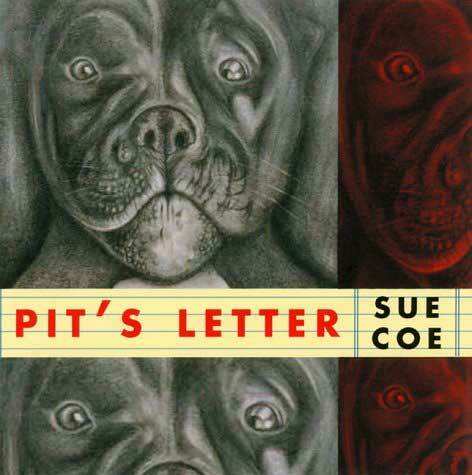 cover: Pit's Letter. copyright © 2000 Sue Coe. 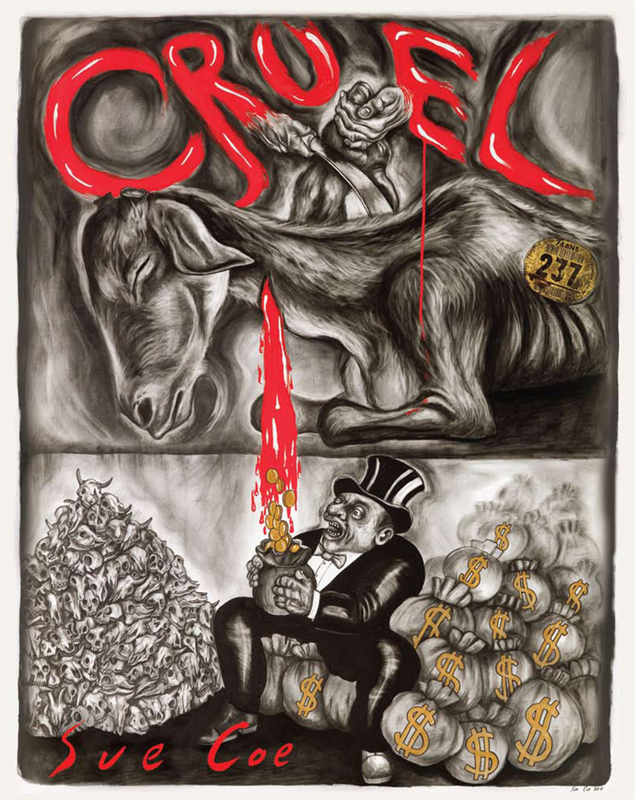 Like a latter-day Goya, Sue Coe is driven to create moral works, from stark renditions of slaughterhouse brutality to accounts of abused domestic animals and laboratory testing. 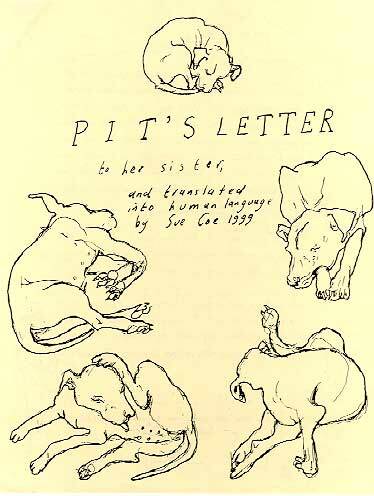 In Pit's Letter, a hapless canine describes her desolate life to her only surviving sister. She recounts her puppyhood and upbringing in her human family, her heartless banishment, and finally her suffering and death at the hands of the experimenting scientists at Eden Biotechnology. Ironically, her former master winds up in the same situation: an accidental scratching infects him with a pathogen - and man and beast share the same fate. Coe, Sue, introductory essay by Alexander Cockburn. Dead Meat, New York: Four Walls Eight Windows, 1995-6. Coe, Sue and Mandy Coe. Vancouver: Gallerie Women Artists' Monographs, 1991. Texts by Mandy Coe, essays by Donald Kuspit and Marilyn Zeitlin. New York: Raw Books and Graphics, Raw Books One Shot #6, 1986. Coe, Sue and Holly Metz. 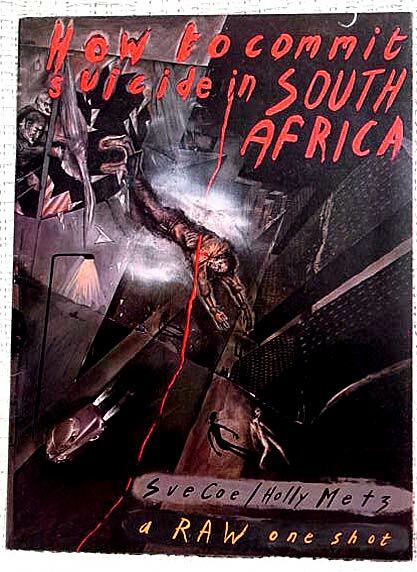 How to Commit Suicide in South Africa. New York: Raw Books and Graphics, Raw Books One Shot #2, 1983 and London: Knockabout Comics (second printing), 1983. Selecting the cover image will open the book, which is viewable in its entirety. Chicago, Judy and Edward Lucie-Smith. Women and Art: Contested Territory, New York: Watson-Guptill Publications. 1999. Gettings, Frank. Directions, exhibition essay, Washington DC: Hirshhorn Museum and Sculpture Garden, 1994. Harkavy, Donna and Helaine Posner, co-curators. 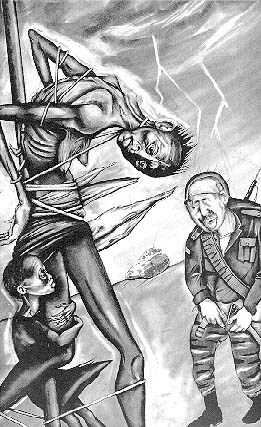 Culture of Violence, essay for exhibition catalog, University Gallery, University of Massachusetts at Amherst, 2002. Heller, Steve. Innovators of American Illustration, New York: Van Nostrand Reinhold, 1986. ___________, and Gail Anderson. The Savage Mirror, the art of contemporary caricature, New York: Watson-Guptill Publications, 1992. Kallir, Jane. 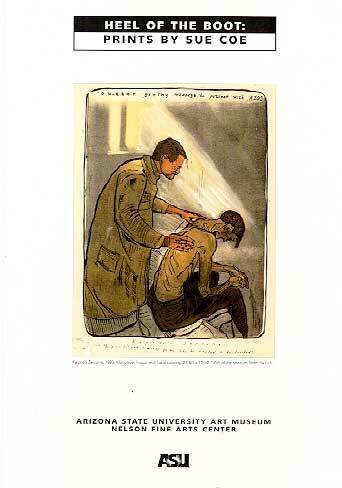 In the midst of an epidemic: Sue Coe chronicles the time when AIDS was a death sentence, Galerie St. Etienne blog, March 2017. __________.Political document of a Decade, exhibition essay, New York: Galerie St. Etienne, 1991. 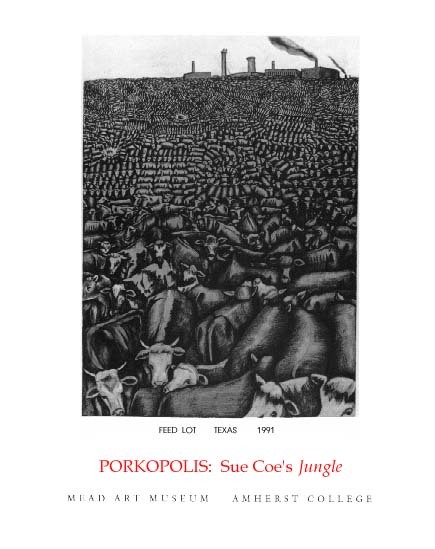 __________ Porkopolis -- Animals and Industry exhibition essay, New York: Galerie St. Etienne, 1989. __________. Ship of Fools, exhibition essay, New York: Galerie St. Etienne, 1996. __________. The Pit: The Tragical Tale of the Rise and Fall of a Vivisector exhibition essay, New York: Galerie St. Etienne, 1999. Kuspit, Donald. Redeeming Art: Critival Reveries. New York: Allworth Press, 2000. [The essay that forms one chapter in this book was originally published in the catalog accompanying the 1987 exhibition Police State]. Morreau, Jacqueline (editor), forward by Marshall Arisman and introduction by Russell Mills. 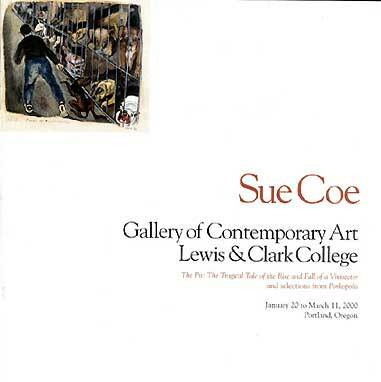 Paintings and Drawings by Sue Coe. Metuchen NJ and London: The Scarecrow Press, 1985. Sclauzero, Mariarosa. 10 illustrations by Sue Coe. Narcissism and Death. New York: Green Carnation Press (Verona Italy) 1983; first trade edition, Barrytown NY: Open Book, c. 1984. CD-Rom -- Comic Book Confidential Ron Mann, author. Voyager: New York, 1994. CD-Rom -- Beat Experience Voyager: New York, 1995. CD-Rom -- Monkey Hell screen saver, Kickstand: New York, 1998. _____________,"Dead-End Kids: Gerhard Richter's political masterpiece" The New Yorker, December 11, 2000. Review of the exhibition "Open Ends" at MOMA, Fall 2000. 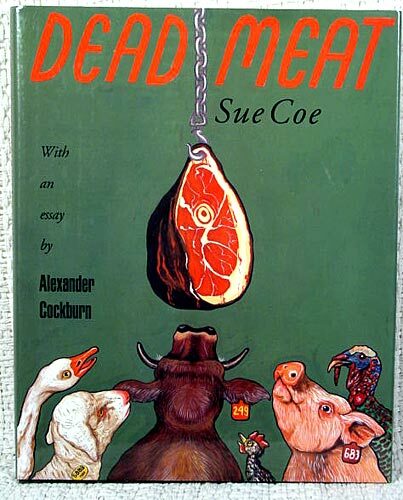 "Sue Coe, the English graphic guerrilla, strangles charm. 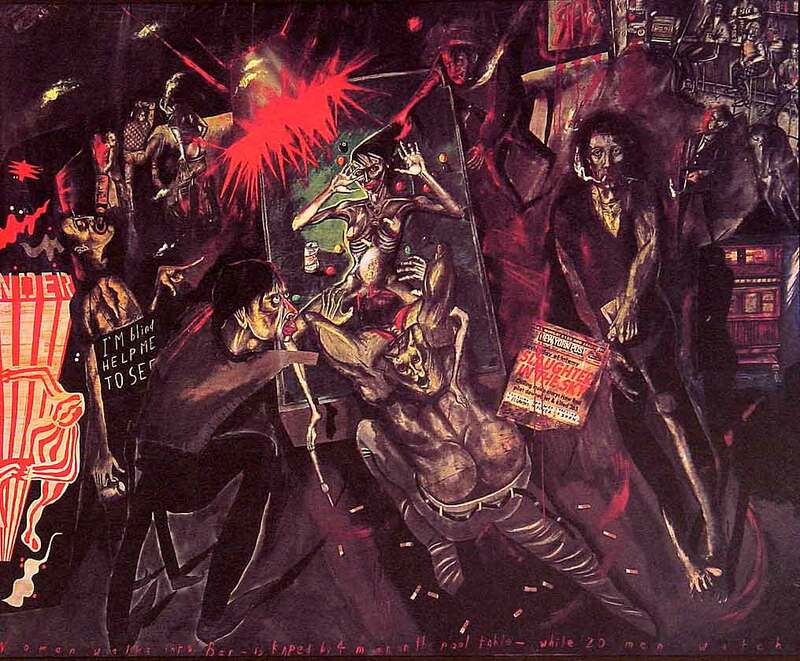 Her big painting .... Woman Walks Into Bar -- Is Raped by 4 Men on the Pool Table -- While 20 Watch ... compares well with the most lacerating works of George Grosz and Otto Dix. Go ahead and hate it. Explain why it's bad. it will still punch your face in."